WASHINGTON - Scientists who are hunting for life on Mars - past or present - are expanding their search to include possible sources of food and energy, as well as water, that could nourish microorganisms on the Red Planet. For years, "Follow the Water" has been the mantra guiding the quest for evidence of extraterrestrial life. The theory was that liquid water was the most essential requirement for any living organism, so the hunt should start with that. That concept now is considered too narrow. The search for water goes on, but it's not the only target. "Water is necessary but not sufficient for life," said Tori Hoehler, an astrobiologist at NASA's Ames Research Center in Mountain View, Calif. "So far we've looked for water, but life also needs raw materials and sustained energy. That's the next thing we should be looking for on Mars." NASA's Mars rovers, Spirit and Opportunity, along with U.S. and European orbiting spacecraft have detected evidence that Mars was warm and wet billions of years ago, with rivers, lakes and perhaps a large ocean. That water has evaporated or sunk underground, occasionally bursting to the surface to carve fresh gullies in canyon walls. Now NASA is preparing to send two landers to Mars - the Phoenix mission later this year and the Mars Science Lander in 2009 - to hunt for organic carbon, a basic building block of life, on or just below the surface. But scientists say the search must extend below the planet's dry, frozen crust to look for buried supplies of water, food and energy where microbes might be living. 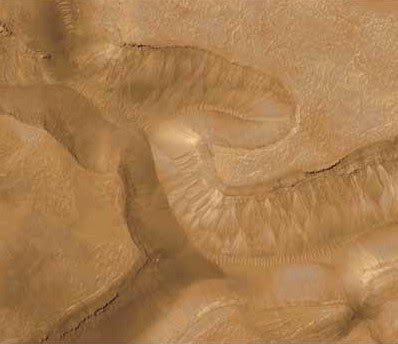 "If life is present on Mars now, it has to be subsurface," Hoehler said. One potential Martian food is methane - natural gas - a simple compound of hydrogen and carbon. Traces of methane were detected last year in the planet's thin atmosphere, apparently leaking out of pockets of gas below the surface. Living creatures are "a potential source of the methane detected in the atmosphere," said Stephen Clifford, a researcher at the NASA-funded Lunar and Planetary Institute in Houston. He cautioned, however, that methane also can have a nonbiological origin. If found, such organisms would be similar to colonies of microbes called methanogens, which feed on methane below the ocean floor on Earth. Onstott has found many examples of what he calls "dark life" dwelling two miles down in South African gold mines. "If you find good evidence of environments that support life in the deep subsurface of Earth, then the chances are high that you will find these environments beneath Mars as well," Onstott told the Princeton Weekly Bulletin. The source of underground energy is "no longer sunlight but the planet itself," Hoehler explained. Mars' interior retained heat, a form of energy, from the time of its formation 4.5 billion years ago. Radioactive rocks also emit a steady stream of energetic particles. "There is chemical energy inside the planet," Hoehler said. He likened it to "the planet's battery." "Oxidizing iron yields energy," said David Des Marais, a geochemist at the Ames Research Center. Sulfur also can combine with oxygen to produce energy. "This is how a lot of things on Earth make a living," Des Marais said. Presumably the same iron and sulfur chemistry would work on Mars. Another potential source of extraterrestrial food and energy is hydrogen, a gas that's starting to be used to power vehicles on Earth and also nourishes underground swarms of microbes. "Hydrogen gas is like junk food to a lot of bacteria," Onstott said. On Mars, hydrogen can be generated by the interaction of radioactive rocks and water. "Hydrogen probably represents the most interesting prospective energy source for would-be Martian microbes, simply because it's always in the picture wherever rocks and water get together," Hoehler said.